9x18 asks if parking can be an agent of change in the current affordable housing discourse. We aim to share this plan with NYCHA communities, and to seek their input in shaping the future of NYCHA neighborhoods. 9x18 approaches the affordable housing crisis in NYC through the lens of parking reform. When Mayor de Blasio unveiled “Housing New York: A Five Borough, Ten-Year Plan," the administration announced the ambitious goal of building and preserving 200,000 affordable housing units. To achieve this goal, we firmly believe that innovation is needed and that the city cannot rely on one-off projects or piecemeal rezoning; a fresh, citywide approach is critical. 9x18 asks if parking can be an agent of change in the current affordable housing discourse by proposing adjustments to parking requirements for new developments and strategic infill on publicly owned parking lots. The “need” for parking is rarely discussed in debates around housing in general and affordable housing in particular. We believe that addressing this citywide issue will bring major stakeholders to the table: private developers, NYCHA residents & officials, government agencies and social groups. The first stage of the 9x18 plan was developed through a fellowship provided by the Institute for Public Architecture in which community members, representatives from city agencies, developers and design professionals came together at a series of public workshops. Now it’s time to take the 9x18 plan to specific communities to engage and empower residents to shape the future of their neighborhoods. Through community outreach, we want to build consensus around the importance of neighborhood planning and stress how each stakeholder can benefit from being part of a strategic plan to re-envision the future of housing in NYC. 9x18 is a collaboration between Sagi Golan, Miriam Peterson, and Nathan Rich. To learn more about the project, visit www.9x18.net. New Yorkers love their neighborhoods and know the sites and local context, as they use them on a daily basis. Engaging with the NYCHA resident community is a crucial next step in building consensus. 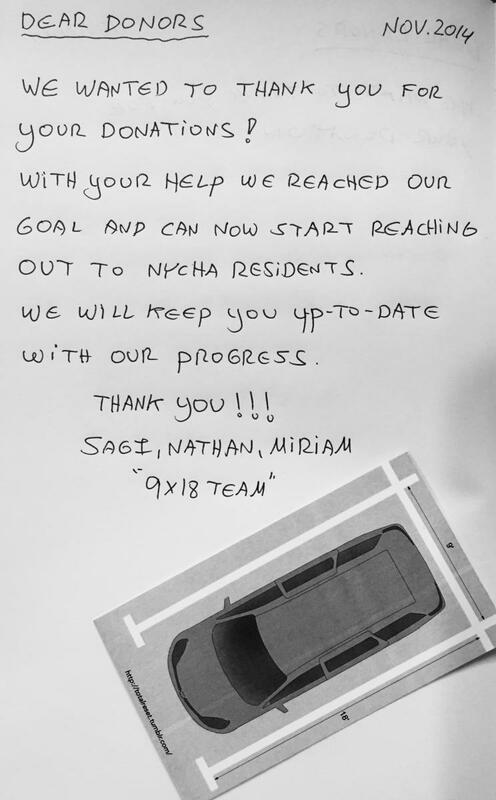 We want to listen and learn from their experiences, to better understand their needs and to provide an infrastructure for residents to offer much needed input that will inform and educate how “9x18” could contribute to providing more affordable housing units while at the same time improving the quality of NYCHA communities. In “Housing New York: A Five Borough, Ten-Year Plan,” The Mayor's office boldly states that the city has reached a “crisis of affordability” and that “things must change”. In a time of “crisis” our team firmly believes that a fresh, city-wide approach to supporting the mayor’s agenda is critical. We believe the lands and requirements associated with parking in New York City are an enormous untapped resource for affordable housing development. With ground-up community planning and Government support, the 9x18 approach could create new potentials for affordable housing development city-wide. At the same time, 9x18 proposes that we embrace this moment of change to generate a conversation about lifestyle and urban priorities. We would ask volunteers to join us for community outreach events on NYCHA campuses. Volunteers will be asked to interview residents by assisting in the completion of a survey that asks questions about car ownership status, daily commute patterns and needs/amenities that they would like to have on their block.